When the last family to own the Middlebury Community House donated it to the town in 1932, they stipulated that it serve as a community meeting place and benefit young people. The refined Federal-style brick house on Main Street, built for Horatio Seymour in 1816, came with its own historic furniture, gilt-framed paintings, crystal chandeliers, sweeping central staircase and elegant mantelpieces. The following 80-odd years saw it used sporadically for meetings, baby showers, holiday gatherings and the like. It wasn't until 2013 that the donors' double wish was truly fulfilled. Finding that hosting occasional events didn't cover the building's operating costs, the MCH board issued a call for proposals for sustainable use. Lincoln native Sadie Brightman, 39, a piano teacher who was giving private lessons in a room in the building, proposed an expansion of her efforts: a Middlebury Community Music Center, where both children and adults could pursue music of all kinds. Her reasoning? "It was a pleasant place for families to wait," she said of the building. "Plus, you could just see the students light up [when they walked in]. It's such a special place." The board was thrilled with the idea. Launched in 2014 and still directed by Brightman, MCMC has been phenomenally successful. These days, 280 students traverse the slate sidewalk and marble steps to reach private or group lessons with two dozen faculty on nearly every imaginable instrument. About three-quarters of the students are children. Classical instruction prevails — on piano, strings, woodwinds and brass — but traditional roots instruments are also taught, as are the bagpipe and ukulele. The center offers a community choir and a children's choir. Faculty members teach group piano lessons, songwriting, voice, and ensemble playing for string quartets and jazz improv groups. MCMC reaches additional children through its outreach programs: world music and West African drumming classes at Mary Hogan Elementary School in Middlebury and Weybridge Elementary School; the licensed Music Together program for tots at Mary Johnson Children's Center in Middlebury and New Leaf Montessori school in Leicester; and — new this year — after-school group strings instruction at Bristol Elementary School. The center involves the community in multiple ways, such as performance salons for the public the second Wednesday of every month and appearances in local eldercare facilities. In November, it sponsored an appearance by an a cappella quartet from southern France at the suggestion of MCMC piano teacher Sarah Trouslard. This month, MCMC just held its annual holiday caroling concert, open to all area musicians and conducted by voice teacher Susanne Peck, an affiliate artist at Middlebury College but unaffiliated with the center. Vermont is sparsely dotted with such community music venues. Montpelier has the Monteverdi Music School; southern Vermont has the Brattleboro Music Center. 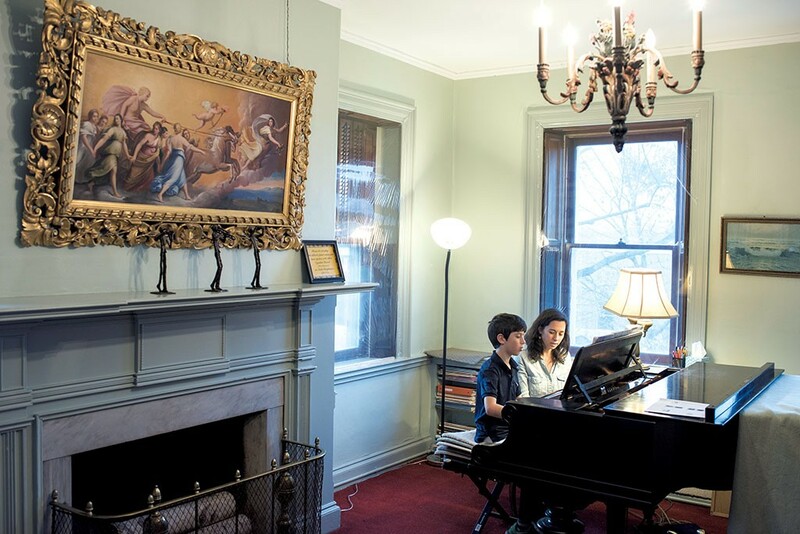 Across the border, the Upper Valley Music Center in Lebanon, N.H., with 850 students, recently moved into a bigger home that, like MCMC's, is a brick, chandelier-adorned 19th-century mansion. Yet densely populated Chittenden County has no equivalent institution. Shelburne pianist Paul Orgel, who gave a benefit recital last year at MCMC, called that a "mystery." He speculated that the area's many independent music teachers might view a community music center as competition. In the late 1990s, Orgel was part of a group effort to launch a community music school in Burlington's Old North End. The group managed to buy a building but nothing more. "It's particularly hard to start a community music school from scratch — which is what Sadie has done and why I admire her so much," said Orgel. "She didn't even have an assistant the first year," added Dayve Huckett, who teaches guitar and ukulele at the center. Brightman eventually hired assistant Molly McEachen, who also teaches Music Together classes. Huckett, whose Burlington-area students "fizzled down to almost nothing" after the 2008 recession, appreciates the access to students that MCMC affords. And, he noted, "It's run by women, so it's fair and friendly and organized." Brightman gave this reporter a tour of the building in early December, starting with the three elegant upstairs teaching studios that she named for movements of a musical suite: Minuet, Sarabande and Allemande. As the smell of cookies wafted up from the kitchen — used by a local baker a few mornings a week — Brightman described her main goal in simple terms: to bring music education to as many people as possible. She draws on 11 years of experience teaching in community music centers in Boston and the Amherst-Northampton area of Massachusetts. Her own childhood is a second inspiration. Brightman grew up in Lincoln, where she now lives with her husband and two young daughters. Her parents and sister also live there. "[My life] is multigenerational — like MCMC," she commented. For her, part of the center's project is "imagining what I would have wanted, and what I want my daughters to experience." Growing up, Brightman sang in children's choirs, took piano lessons with Middlebury College affiliate artist Diana Fanning and did musical theater at Mount Abraham Union High School in Bristol. After obtaining a BA in music at Wesleyan University, she studied piano performance for a year at the Prague Conservatory in the Czech Republic. Though Brightman could have focused on advanced students after that experience, she gravitated toward children and began teaching music and movement classes for toddlers in Massachusetts community music centers. In 2010, she moved back home, established her teaching studio at the MCH and became an affiliate artist at the college. When the MCH board accepted her proposal, Brightman began tapping her large network of music teachers. "I really think of [the launch] like a big bang," she said. "I was excited to have a reason to reach out to people. The response was really magnetic." The threat of competition, Brightman said, didn't figure into her plans. "It was 'Who do we have here, and what interests do they have?'" Knowing that jazz was a big part of Middlebury high schoolers' music curriculum, for example, Brightman decided to "augment their experience" with jazz offerings at MCMC. Mandy Chesley-Park, who directs the Expanded Learning Program for five rural Addison County elementary schools, had her own explanation for the center's success. "The personality of the director is crucial," she said. When Brightman consulted with Chesley-Park on how best to serve families in the area, which the latter described as "slightly impoverished," Brightman wanted to "make sure we weren't stepping on any toes," Chesley-Park recalled — meaning they wanted to ensure they weren't taking work away from school music teachers or private instructors. This fall, the timing was right for MCMC bass teacher Ron White to begin offering the group orchestral instruction program at Bristol. Grants and donations have enabled MCMC to meet all requests for financial aid, noted Brightman, and helped purchase some of the center's six pianos. The director's connections with Middlebury College have produced their own benefits. In 2014, the college had two of its art history majors inventory all of the objects in the MCH building, many of which had to be moved into storage to accommodate the center's growing clientele. Middlebury College pays an intern each year to help with MCMC's administration. And at least six of the center's faculty members are also affiliate artists at the college. 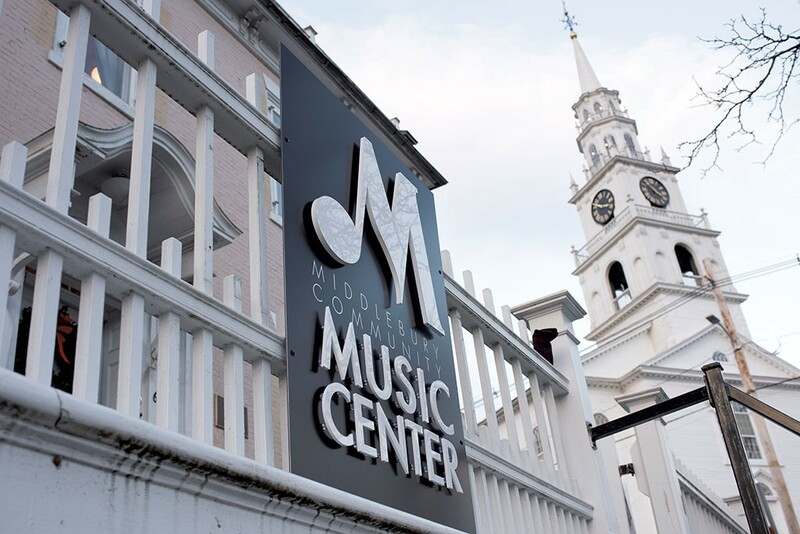 Orgel commented that community music centers "tend to raise the level of music education" simply by virtue of being hubs for musical activity. Brightman sees an even more basic benefit. "There's something powerful about having a centralized place, a building in the center of the community," she said. "Music is something we have to fight for, to keep the space and time in our lives for. But when we're together, we're more likely to keep pursuing it." The original print version of this article was headlined "Sound Investment"